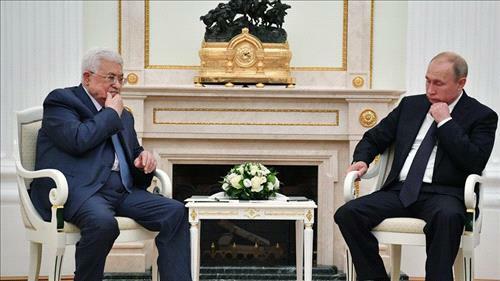 AMMONNEWS - Palestinian president Mahmoud Abbas was in Moscow on Saturday to meet Vladimir Putin, just days after the Russian leader hosted Israeli Prime Minister Benjamin Netanyahu. “I’m glad of the opportunity to tell you about the contact we have had with your neighbors, and leaders of various countries,” Putin told him as they met at the Kremlin, in quotes carried by Russian agencies. “I know that the situation in the region is difficult and we are grateful that you have used the World Cup as a reason to come to Moscow,” Putin said, adding that he was glad of the opportunity to discuss the problems facing the Palestinians. Abbas told the Russian leader of his concerns over US President Donald Trump’s decision to move the country’s embassy to Jerusalem, as well as Israeli settlement activity. “We are resisting attempts by the Americans to impose their decisions on the most sensitive problems of Palestine,” Russian news agencies quoted him as saying in translated remarks. Israel’s military renewed airstrikes targeting Hamas in the Gaza Strip on Saturday afternoon a day after fierce clashes along the border in which two Palestinians were killed, one of them a teenager. More than 220 others were injured according to the health ministry in the Hamas-run Strip.